LG 20MK400A 20" LED Display - with Dynamic Action Sync for reduced input lag, black stabilizer, 1-click button for upto 4-screen split or PiP, 1366x768; brightness- 200cd/m2; DFC contrast ratio - 5000000:1, response time- 5ms - d-sub only - 75x75mm vesa wall-mountable Copyright © 2019 ComXpert International CC - COPYING IS ONLY ALLOWED FOR THE PURPOSE OF SENDING US ENQUIRIES. E&OE. The best price and guaranteed service and backup from official computer suppliers in South Africa for the 20MK400A-B.AFB LG 20MK400A 20" LED Display. 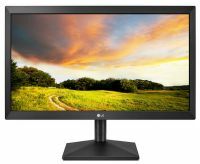 The LG 20MK400A-B.AFB LG 20MK400A 20" LED Display is available for R1250. The product is sold by ComX Computers as new. Prices are valid today 2019-04-22 (before 2019-04-23 , by quote, while stocks last). The product is expected to be in stock, although this is not guaranteed. Find related 20MK400A-B.AFB LG 20MK400A 20" LED Display products in our LED Backlit LCD monitors: 20 inch Category for even more options. Read reviews and find out about 20MK400A-B.AFB LG 20MK400A 20" LED Display. Discounts, specials and cheap prices only at ComX Computers.